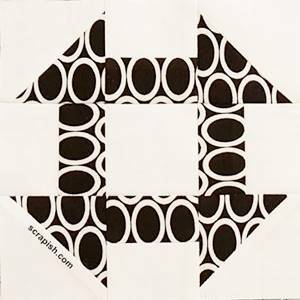 Quilt block patterns to make traditional and modern quilts! 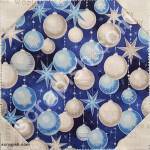 See step by step photos of how to piece blocks using fabric. Quilters of every level of ability from beginner to experienced will find a block or two that appeals to them. Quilt blocks are the building blocks for traditional quilts and some modern quilts. 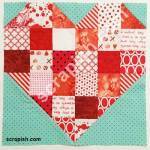 Scrapish.com provides you with a wide variety of blocks to choose from. 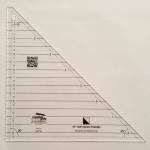 Whether you like simple blocks made from squares and rectangles or a little more challenging block made from triangles you will find several options to try. Each block is done in an exciting rainbow of color - red, purple, green, orange, turquoise, pink, yellow. Neutrals - black, white, brown, gray, cream - are included as well. You'll see a wide variety of fabrics that have motifs suitable for babies, children, adults and holidays such as Halloween and Christmas. I love the fabric! Some of my favorite designs include skulls, folklorio, 30s prints, black and white fabric, floral motifs, stripes, dots, tone on tone prints and animal print (skins) fabric. A lot of the blocks here will have units made from squares and rectangles. For variety, interest and challenge you will find some blocks made from triangles, hexagons and circles. On scrapish.com you will find instructions to make blocks that range in sizes from 6 inches to 18 inches. The tutorials for block patterns are listed alphabetically. Quilt blocks make quilt tops interesting. You'll have favorites no doubt. Choose a block and get started making a quilt! Also, to see the four patch quilt block used in lots of quilt patterns visit quiltindex.org and type in a keyword of the block name, such as 'four patch', in the search box.